/User To Dos & Notes /What is My Notes and How Do I Use It? Is there a widget that can be added to the right-side menu? How can I use the My Notes sidebar widget? Can I format the notes that I take in MangoApps? Can I print out all my notes? Select “Notes” from the left navigation bar in MangoApps. Click “Widgets” on the right hand side and select the small gear icon to select “Widget Gallery”. 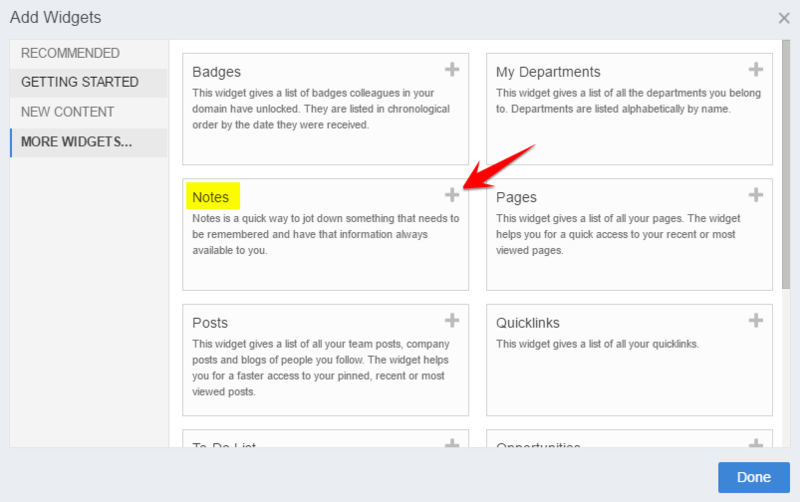 Scroll down to find “Notes” and click the + sign to add the widget. Show you your list of notes from the dropdown menu. Show you some text from the current note that is selected in the list. Be expanded or collapsed to save space. Yes, while composing a note, you can use the familiar WYSIWIG toolbar to add bold, italic, underlined and colored text and other formatting to your note. Yes, you can create a PDF document of all your notes. With the PDF you can attach it to communications or print it out. To create a PDF, click the Adobe Acrobat icon on the Notes page.